Fr esh notebooks, sharpened pencils, a brand new outfit and sporty backpack — signs it's back-to-school season. 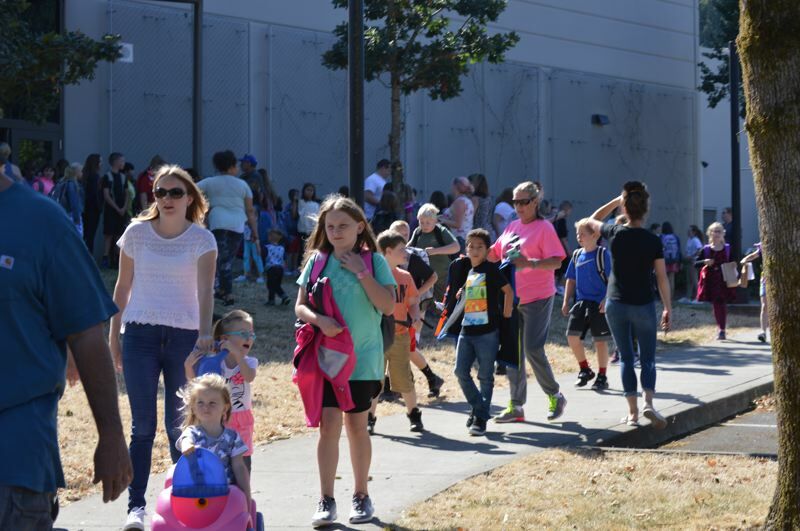 Students in Scappoose and St. Helens school districts returned to class this week, ready to kick off the 2018-19 school year. The new school year rings in a host of changes in each district, from new staff to new buildings and programs. Peterson was selected for the interim superintendent role in May after former Interim Superintendent Ron Alley declined the position in April. Alley resigned from the district in June. Petersen worked for the district from 2006 to 2011, before he was released early from his contract to take a position with Northwest Regional Education Service District. His departure came amid lawsuit allegations he had harassed and discriminated against female administrators. The lawsuit was ultimately settled for $500,000. A press release from the school district acknowledged Peterson's strengths as a leader and expressed well-wishes as he returned to the district. Two board members — Lisa Maloney and Tim Brooks — opposed his hire. Peterson lives in Scappoose and has two children in the school district at Grant Watts Elementary School and Scapppose High School. Several major changes will also be taking place at the high school. The athletic program will be moving from a 4A to a 5A Division, meaning sports teams will face off against larger school districts than they have in the past. The high school also has a new athletic director — Adam Strachan. Strachan will fill the position vacated by longtime AD Robert Medley, who resigned to take a principal position in Burns. Otto Petersen Elementary School welcomes a new building principal, Jennifer Stackhouse, who previously worked in the Gresham-Barlow School District. The district will also have a full-time student resource officer assigned to visit campuses during the week. Earlier this summer, the Scappoose School Board passed the 2018-19 budget, which included an increase in funding to help pay for the SRO. Previously, the officer's salary was funded by the city through the Scappoose Police Department. Overall, the school district continues to expand its science, technology, engineering and math, or STEM, program and is continuing partnerships with Portland Community College. High school staff are also working with the school board to run a pilot program to have a therapy dog on campus. pected to last until next summer. While the district has a variety of new staff, three schools have new principals. St. Helens High School, which was led by two interim principals last school year, welcomes Katy Wagner to the full-time principal role. Cris Gwilliam, who was previously vice principal at the high school, will now lead St. Helens Middle School, which had an interim principal last year. The vacancy left by Gwilliam has also been filled by a new hire — Darcy Soto. The high school also has a new athletic director, Ted Hirning. The district will also increase overall security by having two school resource officers from St. Helens Police Department assigned to work throughout the district. The school district also continues to work with the city of St. Helens to build a recreation program partnership and will be offering a new afterschool program at Lewis and Clark Elementary School. More information about the rec program can be found on the city's website.